The need for reminders does not just apply to kids. I find myself constantly needing to be reminded of parenting skills that I learned and then later found myself slipping on. That being the case, here is a summary list of the key parenting principles that we have been talking about since Passionate Legacy began back in December of 2007. After each principle are links to the articles which address that topic. Who has the authority in your house? 3. Aim at the heart. 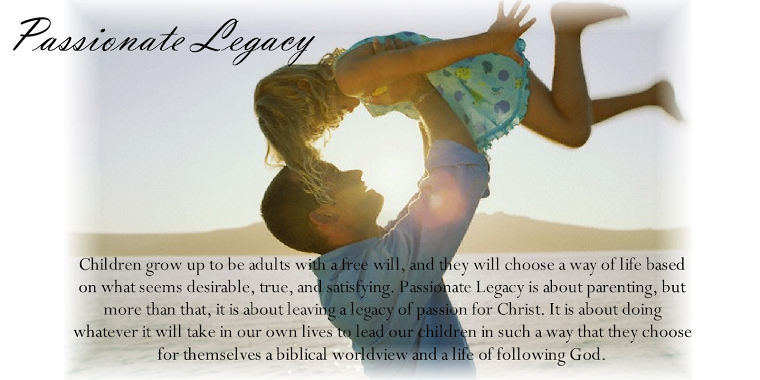 The goal of parenting is to instill a desire and ability to love God and obey him. Our primary goal is to motivate our children to obey God out of love for God and a love for what is right. Our secondary job is to equip them with the tools to be able to accomplish this with success. Fear of Punishment or Love for what is right? 5. Expect obedience. Always ensure that your word is obeyed. 6. Have a plan for discipline. Learn what consequences should be applied to which misbehaviors so that when the situation arises you are prepared to act decisively. 7. Understand the phases of childhood and select discipline that is appropriate to each. 8. Deliver consequences and discipline in a godly, empathetic way. Taking the Anger out of Discipline Fighting the Battle! Is Your Discipline Getting Derailed? Are you getting frustrated at your children’s lack of response to your discipline? Do you find them falling into the same patterns of disobedience and poor behavior over and over again, even after being punished? Do you feel like your discipline efforts are getting you nowhere? I have heard parents say, “Spanking doesn’t work for my kid,” and they give up on spanking. The problem with this type of thinking is that discipline does not work overnight. There are no “quick-fixes” and it may take weeks or even months of consistent discipline to train a child in a certain area. Be patient, be consistent. Procrastination: Repeating yourself and then not following through until you are angry, only teaches the child that it is safe to ignore the first three or four commands. Threatening some discipline, but not following through, teaches the child that your word is meaningless. Remember, children can learn first-time-obedience, if it is expected every time. Talking too much when the child or parent are angry: Our talking during discipline should be as brief as possible, and limited to what they did wrong and what they need to do right. Advising, lecturing, moralizing or teaching when either the adult or the child is seething with negative emotions will turn off the child’s ability to listen. Discipline should be as brief and non-verbal as possible. Verbal training should be done at positive times. Negative Scripting: Children will believe they are, who you say they are. Don’t call them names, label them, predict a negative future or devalue them in any way (e.g. “Why are you always such a slob?”). Bribing: Bribing will teach your child to expect rewards for obedience rather than to obey because it is right. Anger: We believe one of the biggest “Discipline Derailers” is anger. When we get emotionally involved, and our anger gets the best of us, we have lost control of ourselves, control of the situation, and the respect of the child. How can we expect our children to control their impulses when we are not in control of our own? When we yell, get sucked into intense arguments, slam doors, call names, or belittle the child, we have sabotaged our efforts at discipline. We should speak to our children in a calm and respectful way, and deliver consequences in a godly and empathetic manner. Add to that, a lot of patience and consistency, leading by example and a whole bunch of prayer, and we are on our way to leaving a Passionate Legacy in the lives of our children.